Inspired from its heritage of the parent brand Allen Solly, Solly aims to stand as a brand of its own for as a confident expression of who the Solly woman is. The store environment is designed and presented as a distinctly softer, vibrant and chic take on the Allen Solly design philosophy. Located in Select City Walk, Saket, Delhi the newly launched Solly store offers a plethora of options to the woman of today and have her ensemble speak for her. Spread over 2500 sq ft, the store was based on the concept of a loft with feminine accents to it, which would portray the space as her own; a space that she considers to be her comfort zone. Bangalore-based Restore Solutions worked with the Allen Solly team to give the Solly woman a space of her desires. The store front with a unique angled window and veneered branding distinctly sign the store as a woman's choice. The back open windows with the large 3d typographic cut-out letter display makes a soft but bold brand statement that allows view past it to the inviting brand environment. The loft impression is carried in the store interiors with a tasteful combination of wooden rafters, rough textured white ceilings, brick / plastered walls, eclectic furniture with chest of drawers detailing and herringbone patterned flooring. 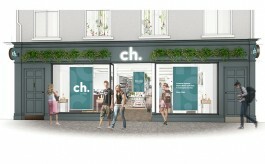 These came together in a light environment to create the identity of the store. A combination of the wall textures, evocative VM and elevations distinguish the casuals from eveningwear and office wear. The props, visuals and typography are weaved together to create the story for each zone. Taking on a clear language, the store planning allows shoppers to easily browse and navigate in the store. The perimeter fixtures have a grid system that is modular and lends itself to merchandise the fashion coordinated featured on them. All fixture bases and tables have a nice touch of imitation drawers to complement the loft theme. Display tables are an eclectic combination of contemporary and classic adding the tasteful home touch. The concept color palette is rendered in feminine tones to create a great back drop for the fashion statements created by the collections. The VM stories featuring them strongly reflect the brand archetype, a woman who is elegant and charming yet confident and adventurous. A combination of VM props such as teal tinted mason jars with pink flowers, abstract white bird forms, beautifully shaped custom-made vases, clipboards with imagery and messaging, storybooks and diaries have been used to curate VM hotspots across the store. 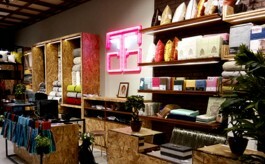 Taking from the parent brand, the props used in the store make subtle and prominent connections to London. An interesting play of black and white complements the colourful visuals and together make for a vivacious mood board. Every detail of the visual language is crafted and bespoke. "The brief contained a very specific fit-out budget. The store design and material specifications were minutely worked out to fit the budget. So yes, trade offs were made - but never at the risk of the design concept,â€ says Lisa Mukhedkar of Restore Solutions.